Hello guys. I'm glad to announce everyone that we've got another interesting scoop from Disney for the movie Alice in Wonderland. Here is an exclusive look on how CGI is done in this flick to achieve the film's fantasy mood and gothic touch of Director Tim Burton. 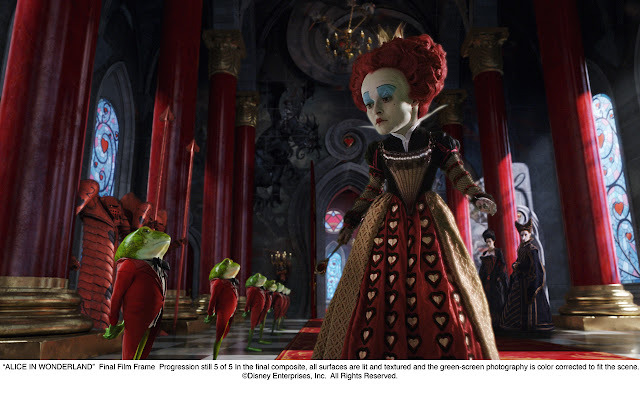 IRACEBETH, THE RED QUEEN (Helena Bonham Carter) is the tyrannical monarch of Underland. With her oversized head, fiery temper and propensity to scream for people’s heads to be chopped off, she rules her subjects through fear. “She’s got emotional problems,” says Bonham Carter. “It takes nothing, practically, for her to lose her temper. Her tantrums are that of a two-year-old.” Her younger sibling, the White Queen, has designs on the throne and crown that Iracebeth once stole from her. 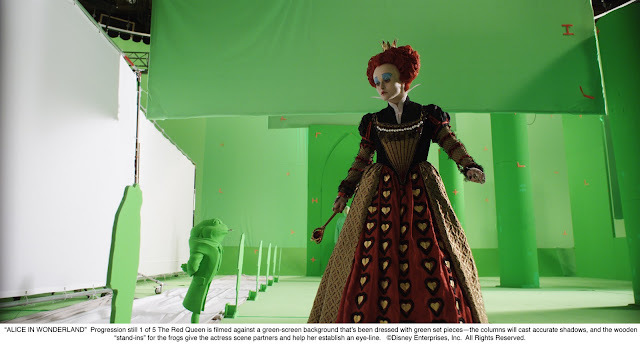 The Red Queen is filmed against a green-screen background that’s been dressed with green set pieces—the columns will cast accurate shadows, and the wooden “stand-ins” for the frogs give the actress scene partners and help her establish an eye-line. 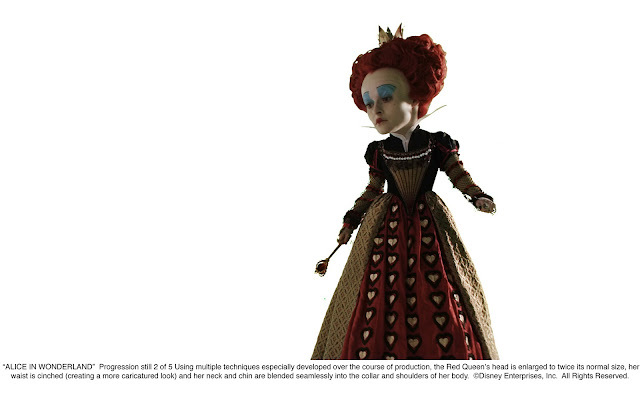 Using multiple techniques especially developed over the course of production, the Red Queen’s head is enlarged to twice its normal size, her waist is cinched (creating a more caricatured look) and her neck and chin are blended seamlessly into the collar and shoulders of her body. Animators at Imageworks add in CG frogs and red knights, along with the birds holding the chandelier and the monkeys holding the candelabras. 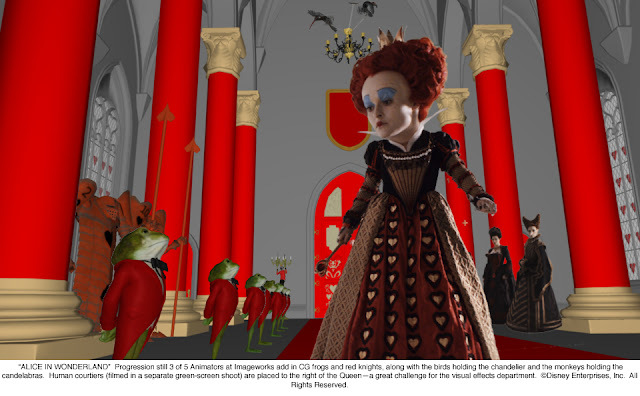 Human courtiers (filmed in a separate green-screen shoot) are placed to the right of the Queen—a great challenge for the visual effects department. 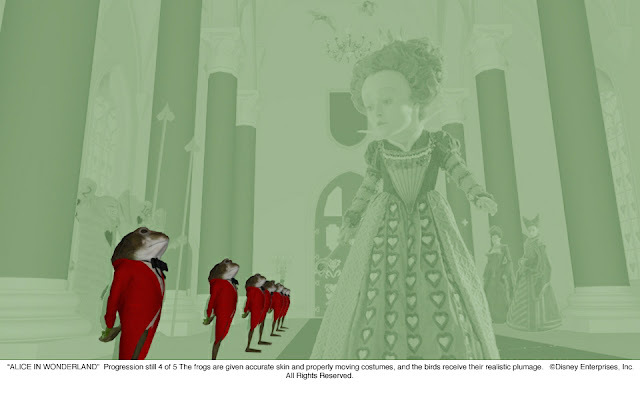 The frogs are given accurate skin and properly moving costumes, and the birds receive their realistic plumage. In the final composite, all surfaces are lit and textured and the green-screen photography is color corrected to fit the scene. Wow that is a lot of work. Good thing the production got a good number of magnificent post production artist to make this film's surreal world come to life. Watch out for more Alice in Wonderland Exclusive and watch out for the film this coming March 4 on Digital and IMAX 3D.